Charles Kenneth Leith (January 20, 1875 – September 13, 1956) was an American geologist. He was head of the University of Wisconsin–Madison geology department for thirty years. In 1942, he won the Penrose Medal, the highest award given in the geosciences. Leith was born in Trempealeau, Wisconsin. He was hired by Charles R. Van Hise as a stenographer in 1892 to work on his publications, and was so taken by the work that he completed a bachelor's degree in geology at the University of Wisconsin in 1897 and a Ph.D. in 1901. 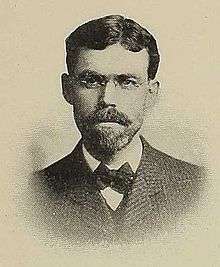 In 1903, when Van Hise became president of the University of Wisconsin, he hired Leith as head of the geology department at the age of 28. Leith was chair until 1934 (31 years), and remained with the department until he retired in 1945. He also lectured on structural and metamorphic geology at the University of Chicago beginning in 1905. His early research focused on the geology of the Lake Superior region, including the ore deposits of the Mesabi range. He served as a consultant for the location and valuation of ore deposits for several mining companies and served as mineral adviser to the U.S. Shipping Board and the War Industries Board during World War I. He organized studies of world mineral supplies in the 1920s and served on many government agencies, including the Atomic Energy Commission, through the 1950s. Leith also won the Penrose Gold Medal of the Society of Economic Geologists in 1935. 1 2 Rines, George Edwin, ed. (1920). "Leith, Charles Kenneth". Encyclopedia Americana. ↑ "Penrose Gold Medal". Society of Economic Geologists. Retrieved 15 May 2012. DENIES STEEL TRUST HAS ORE MONOPOLY; Prof. Leith Testifies in Federal Suit That Its Holdings Are Less Than in 1911. New York Times, October 2, 1913, p. 16. Memorial to Charles Kenneth Leith, 1875–1956, Richard Jacob Lund, published by the Geological Society of America, 1957. Charles Kenneth Leith 1875-1956: A biographical memoir, by D. F. Hewitt. Washington, DC: National Academy of Sciences, 1959. Sylvia Freeman Wallace Mcgrath: Charles Kenneth Leith: Scientific Adviser, Madison, WI: The University of Wisconsin Press, (1971).